2018 will be our second year operating the Aquaglide Aquapark at Manley Mere. 2017 was a BIG hit with all our Aquapark visitors, so much so we're adding some fantastic new pieces for 2018 making it one of the largest Aquaparks in the country. 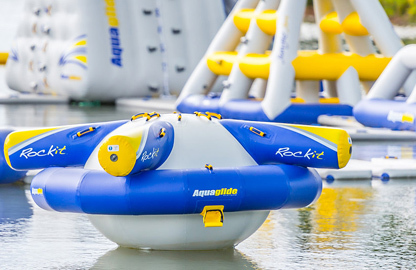 Come along and join us for an aquatic adventure like no other - it's a great way to to have some action packed fun with friends and family flying into the air from the blast bag or getting rinsed in the cyclone whatever the weather (for all ages 8 and above). Many of our visitors combined a high energy session on the inflatables with a crazy walk around our Adventure Trail, hiring canoes or paddle boards and ending the day in the Chameleon Cafe Bar and Restaurant to make a memorable day out at Manley Mere. 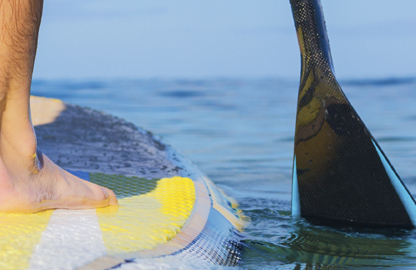 Experience the UK’s fastest growing water sport -Stand Up Paddle boarding! It's a great fun and an enjoyable workout. Try it with the family or a group of friends and see what all the fuss is about. Or how about hiring single or double open deck Kayak and see if you can find the secret brook? We also have Canadian canoes for hire on the lake. 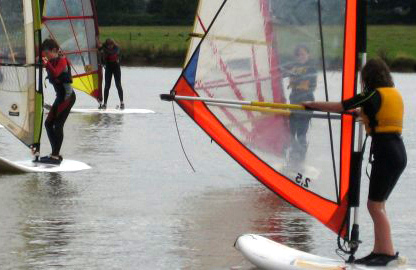 Dramatic improvements in techniques and equipment in recent years have made windsurfing an easy sport to learn. We specialise in getting beginners on the water and onto modern kit with professional instruction. Windsurfing is not only great fun and full of thrills and spills, windsurfing works your core muscles as you balance on the board. You use your entire body to maneuver the sail rigging and steer, so you work your arms, back and legs as you sail. The constant adjustment of balance to your core ensures that it's constantly engaged and working - a great way to keep fit!